It's one of the best-known facts in all of Canadian history: our first Prime Minister drank. Like, a lot. Sir John A. Macdonald wasn't just a charming social drinker; he got the kind of drunk where you find yourself puking on a chair at the Governor General's residence. Or throwing up on stage during a public debate. There were times when he went on benders that lasted for days, too drunk to show up for his official duties. And on a winter night in London, England — right in the middle of the final negotiations over Confederation — it seems to have nearly cost him his life. This was in 1866. Canada was on the verge of becoming a nation. All the biggest politicians from the Canadian colonies had already met at two big Confederation Conferences — first in Charlottetown and then in Quebec City — to hammer out the basic framework for a new country. Drinking had famously played an important role right from the very beginning. In Charlottetown, Macdonald and his allies from Ontario and Québec showed up with $13,000 worth of champagne. Boozing and dancing and getting to know each other socially became a vital part of the nation-building process. And by the end of the meetings in Quebec City, the delegates had agreed on a list of 72 Resolutions. Now, all they had to do was to turn those resolutions into a Canadian constitution and get it officially approved by the British parliament. So they headed off to England for one last big push. They called it the London Conference. And it got off to a very slow start. The delegates from the Maritimes arrived in July. But the others were nowhere to be found. They were still back in Canada — delayed, in part, by Macdonald's drinking. The strain of Confederation and other political stresses were taking a toll on the man. That year, his alcoholism got worse. "He was drinking more heavily, more continually than he had ever done before," Richard Gwyn explains in the first volume of his Macdonald biography, "at times having to grip his desk so he could remain standing in the House." It wasn't until November that Sir John A. and the others finally showed up. Macdonald was no stranger to drinking in London, either. In fact, he'd already been made an honorary member of one of the most exclusive gentlemen's clubs in all of England. The Athenaeum Club is still there today, right in the middle of the city, between Downing Street and Piccadilly Circus. Many of the most famous people in Britain have been getting drunk there for nearly 200 years: members have included Darwin, Dickens, Churchill, Kipling, Sir Arthur Conan Doyle, The Duke of Wellington, T.S. Eliot, W.B. Yeats, Thomas Hardy, Michael Faraday, Sir Walter Scott... the list goes on and on. It became one of Macdonald's favourite haunts on his frequent trips to the capital. And it was far from the only place where he drank when he was in town. The London Conference was being held just a few blocks away: at the Westminster Palace Hotel, right across the road from Westminster Abbey. The delegates spent their days in a big room on the main floor, working out the details of the bill that would need to be passed by the British parliament. Macdonald, as always, led the way — one British official called him, "the ruling genius and spokesman." By the end of the conference, he was a celebrity in England, getting recognized on the streets of London. At night, the delegates would head upstairs to sleep. Macdonald — whose wife, Isabella, had died many years earlier after a long battle with illness and an opium addiction — had a room all to himself. So that's where he was was on a Wednesday night just a couple of weeks before Christmas, reading that day's newspapers in bed. He'd already changed into his old-timey pyjamas. A candle flickered on the night table beside him. And while there is, of course, no detailed record of just how much Sir John A. had been drinking that night, it seems very likely that alcohol helped lure him into an early sleep. He woke to the smell of his own burning flesh. He'd passed out while reading the paper and the candle tipped over, setting the room ablaze. The curtains, the sheets and blankets, even the pillow beneath his head and the nightshirt he was wearing were all in flames. 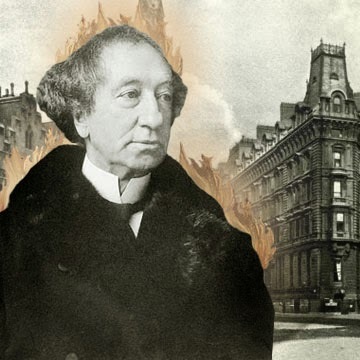 Just months before he became the first Prime Minister of Canada, Sir John A. Macdonald was on fire. Suddenly awake, he leapt to his feet, tore the blazing curtains from the window and stomped out the flames. He ripped the burning blankets from his bed and doused them with water from a jug on his nightstand. Then Sir George-Étienne Cartier came to his rescue. Macdonald and Cartier hadn't always been on the same side. During the Rebellions of 1837, Cartier had fought with the rebels in Québec while Macdonald stood guard for the Loyalist militia in Kingston. But now, Cartier was Macdonald's most important ally, bringing Québec into Confederation. His room was just next door. So as Macdonald's bed and curtains smouldered, the two most notable leaders of French- and English-Canada worked together to make sure the flames were all completely smothered. It was only then that Macdonald noticed just how badly he'd been hurt. His hair, his hands and his forehead were all burned, but the wound on his shoulder was the worst. If it weren't for a thick flannel shirt he'd worn under his nightshirt, he admitted, "I would have been burned to death." Suffering from those injuries and a subsequent infection, Sir John A. would spend eight straight days in bed. But he survived. And so would Confederation. Months later, the delegates' bill was passed by the British parliament. It was called the British North America Act; it came into effect on July 1, 1867. The Dominion of Canada was officially born. And Macdonald's battle with the fire in his hotel room wasn't the only life-saving event during his trip to London. Just a few days before the blaze, he ran into an old friend while walking down one of the most fashionable streets in the city. By the time they left London, Macdonald and Susan Agnes Bernard were married — celebrations included a breakfast feast at the very same hotel where Sir John A. had nearly lost his life. His new wife would prove to be unshakeable in her quest to curb his drinking. And while, in the end, it was a losing battle — there were still plenty of benders to come — one of Macdonald's biographers figures that her efforts may have added as much 20 extra years to his life. Enough time to spend nearly two decades as Prime Minster and leave a deep and lasting legacy — for better and for worse — on the country he helped to create. So today, 200 years after Sir John A. Macdonald was born, he's still the most famous drunk in all of Canadian history. A version of this post was originally published on The Toronto Dreams Project Historical Ephemera Blog. You can find more sources, links, photos, and other information there.